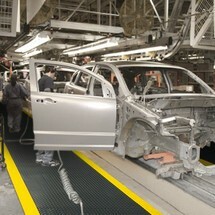 The heavy-duty anti-fatigue mat is used in dry, industrial environments with high demands. A base of micro cells and vinyl provides an outstanding anti-fatigue effect. The boltless system for welder workstation comprises individual base plates in fire-resistant nitrile rubber which you individually lay and fit together. Additionally available edge strips prevent people tripping over the edges. 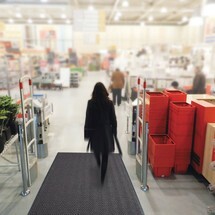 This dust control mat for inside keeps your entrance area clean. As people walk across it, the dust is brushed from their shoes, keeping the floors clean and tidy. These shock-absorbing and non-slip workstation mats relieve fatigue during long periods of standing. They are comfortable and go easy on the feet, legs and back. This non-slip rubber mat has an anti-fatigue effect. It consists of shock-absorbing SBR rubber (styrene-butadiene rubber) and is suitable as a stable surface in the industrial sector. 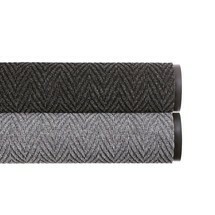 The profiled anti-fatigue mats have a dampening effect and ensure good circulation for the legs – even when standing for long periods of time. This enables you to work fatigue-free and with concentration. The robust mats made from rubber relieve employees’ feet, legs and back when standing for long periods. In addition, they are antistatic and resistant to most industrial oils and chemicals. 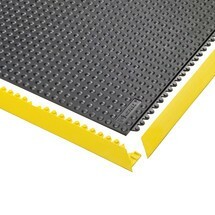 These plastic floor coverings ensure a secure footing in wet and slippery working environments. The plug-in plates are easy to lay and individually assemble. 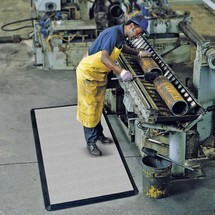 The fabric mat allows healthy and concentrated work in fatigue-free state. If a part is dropped, it lands gently on the cushioned mat. 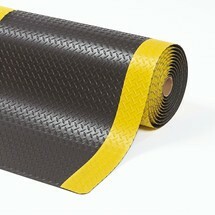 The fabric for the anti-fatigue mat absorbs excess oils that drip off during work. 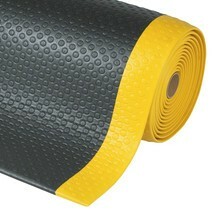 It can be ordered as an accessory to the anti-fatigue mats. 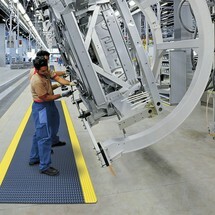 Together they create a non-slip surface for work in factory buildings. 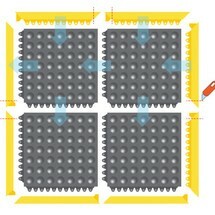 The dust control mats for indoors can, for example, be laid out on the floor in an entrance area. They ensure that dirt from shoes remains outside the door. Using edge strips for the boltless system for welder workstations produces clean edges to the base plates and reduces the risk of tripping. Make outside edge particularly visible by using edge strips in signal colours. The connector for the edge strip on the mat edge is part of the anti-fatigue mat. The edge strips prevent tripping and are extended via the connector.